In this exhibit, we showcase over a hundred photos from our recently acquired collection of the work of artist photographer Manoug Alemian (1918 – 1994). The exhibit offers a rich and varied sampling from Manoug’s oeuvre, ranging across dates (1940s – 1970s), subjects (portraits, landscapes, festivals, crafts, etc.) and media (silver gelatin, color prints, negatives and transparencies). 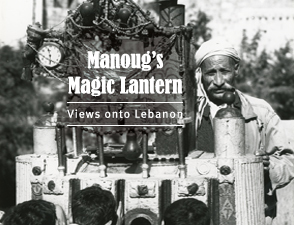 It is no exaggeration to state that Manoug's photographic oeuvre, much like a magic lantern, transports the viewer into a realm from which an iconic image of pre-war Lebanon, one that influenced an entire generation, sprang. Using his keen photographic eye and a distinctive “artistic-documentary” style, Manoug offered a seamless combination of mimesis and metaphor: the landscapes, archeological sites, crafts, portraits, and visual juxtapositions that constitute Manoug's photographic art helped construct and reinforce a way of seeing the Lebanese nation that came to pervade the psyche not just of the Lebanese, but of a wider audience of Arab and international viewers. Many thanks go to Dalya Nouh and to Hana Sleiman for their support in research and technical matters; to the Digital Unit at the AUB Libraries, especially Mr. Elie Kahale and Youssef Doughan for their unwavering support; and to Sara Jawad for her hard work on the design and other matters. Many thanks also go to Ms. Sonia Alemian and to Mr. Ashod Alemian for their great support.